Sunday January 6th 2013. Turton Trot. 19 miles from Jumbles Res. Leader: Mark Davies. 40 walkers and 6 dogs. I spent two half days over Christmas walking over the route I had planned and was very glad that I did. One day was around the Entwistle, Wayoh and Jumbles Reservoirs, the other along the Witton Weavers Way and Darwen Moor. On the Sunday morning cars started to arrive from 8.30 onwards; some people travelling from distant lands just to join our walk. I was delighted; there were several LDWA members who had journeyed all the way from Leigh in Lancashire (to be totally accurate Greater Manchester) anyway they seemed most pleased to be out for the day. I offered food in the form of a Stollen cake and Mince pies. Some members of the group were very suspicious of this genuine act of kindness and one member in particular suggested that I was trying to buy friendship, he was not offered Stollen or Mince pies and I think on reflection this short sighted action on my part created some unrest within the party. At 9.00AM prompt we were gathered together and a photograph was taken, many thanks Hilary. I feel sure that with careful use of photo shop and some editing the final picture will be a fair representation on the motley crew who assembled. I was invited to give a short speech about the walk and in anticipation of this had spent several hours preparing a detailed talk on the wonders of the area and all the sights we would share on our journey; but had to cut it very short due to the amount of heckling and at times abuse I received. All un-expected and in my opinion un-called for. I decided the best course of action was to put as much space as possible between myself and the rowdy members of the group and headed for the car park exit. The walk had begun. 39 people started the walk and another member joined us shortly after the start, the largest group walk the East Lancs had EVER held I was informed only to be told by one of the hecklers who by now had caught me up despite my best efforts to avoid him. He informed me that he had once organized an event with over 80 walkers. The early section of the walk passed through one of Bolton’s best preserved 1960’s housing estates. Then on through Eagley Valley where a couple of early morning archers were given the opportunity to shoot at some moving targets. Thank goodness they declined the offer. North bound and past Delph Reservoir and onto Witton Weavers Way. A short coffee stop was taken exactly where I had planned on the stroke of 11 o’clock. The views were limited as the mist was down but I thought the conditions enhanced the whole experience. I am not sure that the entire group agreed. Refreshed we made our way to Tockholes and through the wood and up and onto Darwen Moor. As we ascended higher the mist became even thicker and I made every effort not to loose any member of our large group. I am very embarrassed to say I failed and with hindsight should have taken far more care to ensure everyone was safe. About half the group became separated from the other half; after several phone calls we were all reunited. At this stage I cannot say any more about the incident until the full public enquiry is concluded and its finds are published in early 2019. I only hope that red cards will be issued. Lunch was taken and then a hasty pace set to exit the Moor. After crossing the A666 we followed the 3 reservoirs back to our starting point, having a short drinks stop. Time Taken. 7 Hours 15 Mins. Many thanks for your wonderful support, even you Norman and all the thanks and kind words during and at the end of the walk. I keep telling friends of this wonderful organization that I have joined called the LDWA and Sunday only confirmed the fact. Wednesday January 16th. 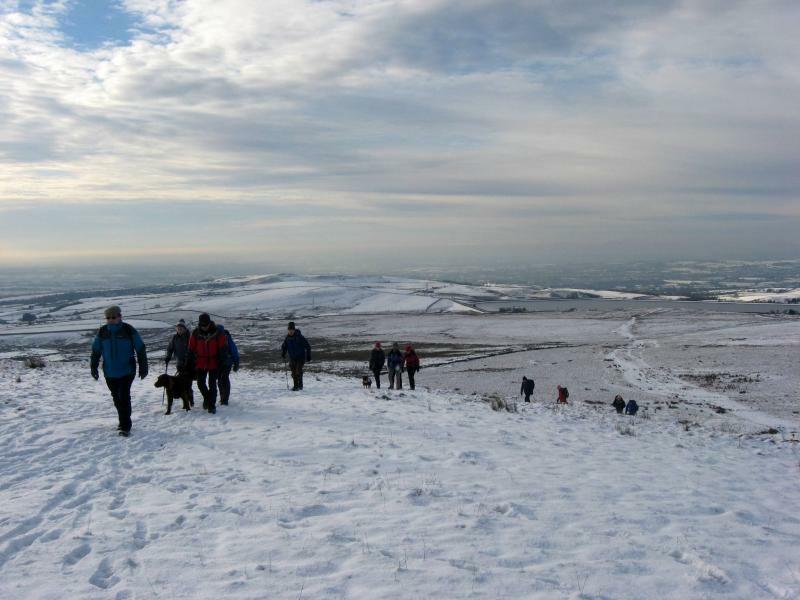 Advertised walk: Ashworth and Naden Valleys. A change of route to this walk. New Leaders: Mike Harrington and Andy Hayhurst. 32 walkers and 3 dogs. 13.5 miles. 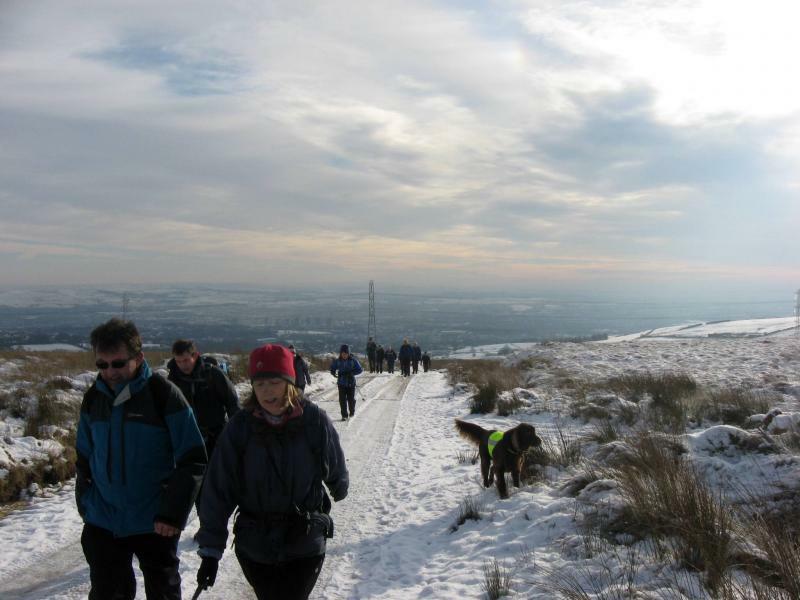 32 people and 3 dogs gathered on a frosty morning for the first Wednesday outing of the year. Must be a lot of mince pies to be walked off. Don came to see us off and it was lovely to see him looking so well. Mike Harrington and Andy Hayhurst, who had kindly stepped in to lead the walk in Mike Lee's absence, had decided to alter the route to suit the conditions and they didn't disappoint. 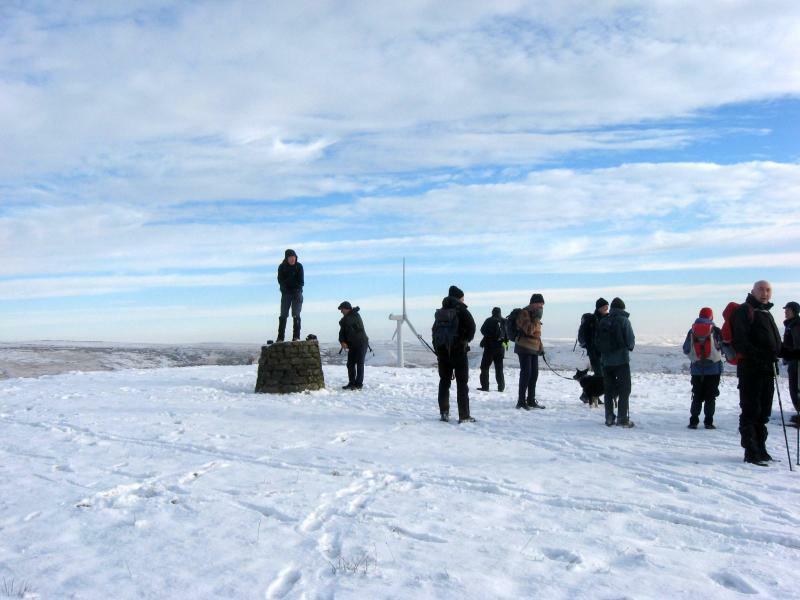 We set off at a smart pace up Knowl Hill and gathered, with some huffing and puffing, at the top to survey a wonderful snow clad landscape. From there we headed towards the Naden reservoirs, taking morning coffee on the dam of Green Booth. Skirting the bottom of the reservoir we headed towards Rooley Moor Road. 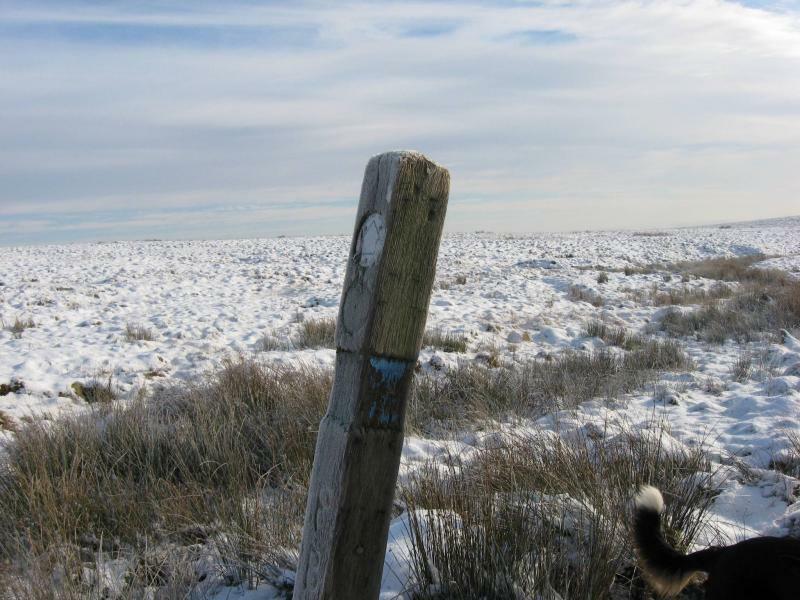 We followed the "cotton famine road" round the edge of the moor to where it leaves the Rossendale Way. 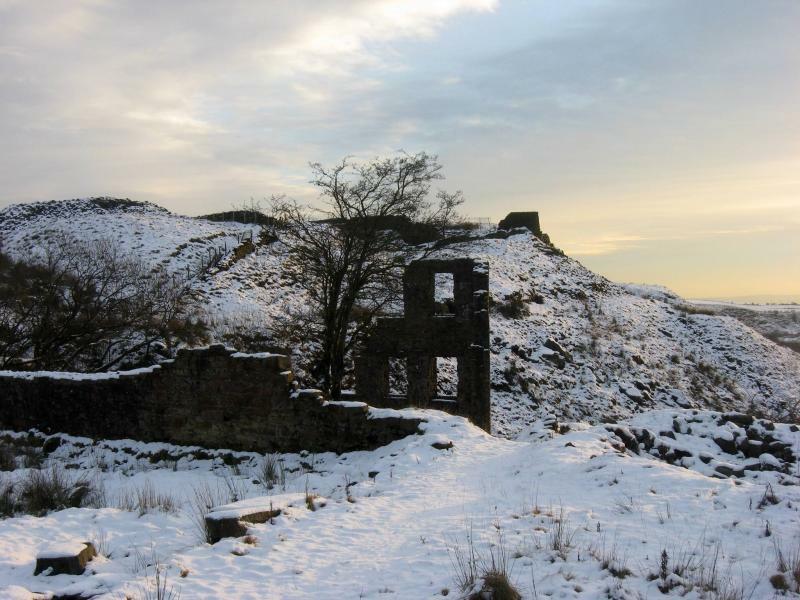 We took the Rossendale Way towards Cragg quarry near where we had lunch. A splinter group had gone to look for Hailstone Hill, the highest spot in Rossendale, but wisely decided not to stray too far and rejoined us at the lunch stop. Leaving the Rossendale Way we descended down to the Plunge and crossed the main road at the splendidly named Michael Wife Lane. As we passed the animal sanctuary some people began to wonder how we were going to get back to Owd Betts. Up a very steep and slippery track was the answer, the only thing worse than going up would have been coming down. Recovering our breath the last leg took us over Harden Moor to the top of the Ashworth Valley and back to the cars. Thanks to Mike and Andy for a splendid day out. Thanks to Don for the first 4 pictures and to Mark for the last six. See below for a link to Alan Rayners photos and blog of the day - fabulous. Below is Martin's blog and photos from the walk. What a good day we had. Sunday January 20th. Wrea Green Wander. 18 miles from Wrea Green. Leader: Margaret Oliver. 22 walkers and 2 dogs. It was a grey, overcast but thankfully dry day as 22 walkers assembled round the impressive village cricket ground, the centrepiece of picturesque Wrea Green. 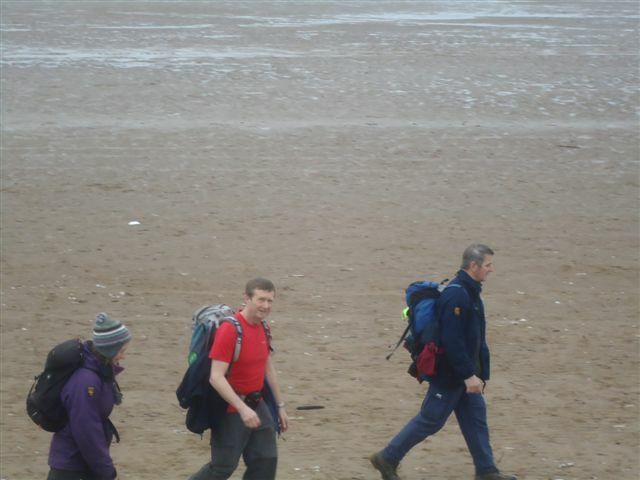 After a hesitant start, the walk got under way down country paths and lanes towards the Ribble Estuary. 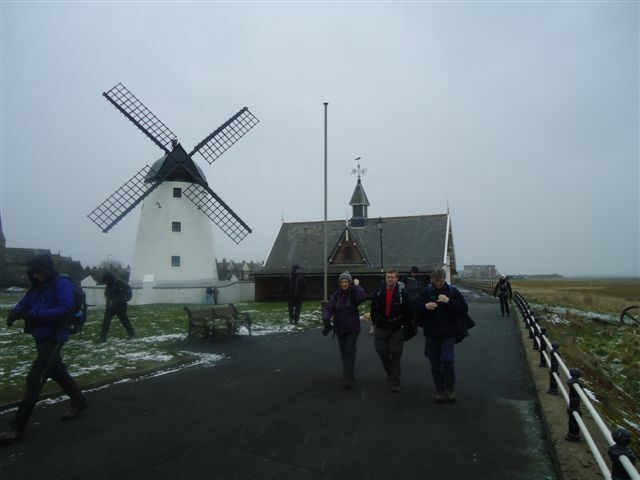 Arriving at the A584 the group proceeded on the Lancashire Coastal Path along the promenade to Lytham Windmill, the perfect place on any day for a short break for coffee. 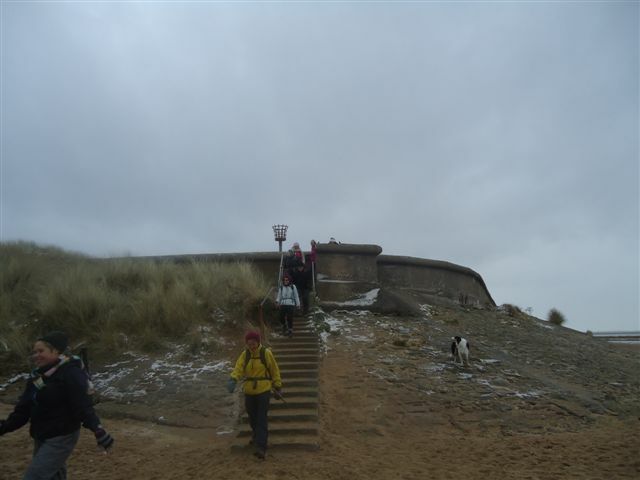 Braving the sudden snow shower, we walked onwards to Granny’s Bay, passing Fairhaven Lake then a walk along the beach to St. Anne’s. Heading inland into a very cold wind, we passed St. Anne’s Golf course (no-one playing today!) and on to an animal sanctuary where we had a lunch break. The whip was cracked to get everyone moving again and we continued on to Sluice Lane, marvelling at the dozens and dozens of swans in the nearby fields, and along Moss Hall Lane to Higher Ballam. John Bullen even managed to recruit a passing walker to join the LDWA! Passing Moss Side station, it wasn’t long before we arrived back at our cars in Wrea Green. This was a wonderful walk and we’ll be asking Margaret to put it on again some time. 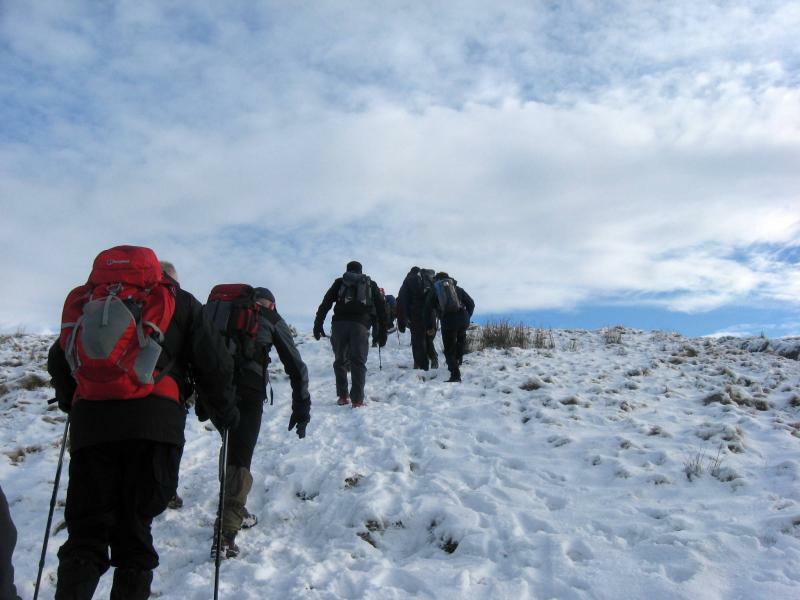 It is one of those outings you could do at any time of the year in any weather and it would take on a different complexion but still be hugely rewarding. Pretty incredible mud and the terrible state of the footpaths along the section of the Lancashire Coastal Way from Lytham to Freckleton saw Margaret forced to completely change her intended route just the week prior to the scheduled date. You can only assume that the Countryside Service have abandoned all efforts to maintain the public footpaths on the outer perimeter of Wharton aerodrome. What a superb alternative she came up with! Well done Margaret. Thank you to John for the pictures. Friday 25th - Sunday 27th January 2013. Ambleside Weekend Away. Organised by Viv Lee and John Howarth. It started to snow about midday, and it carried on and on and on…. However, most of the weekend party had already arrived safely, having travelled up to the Old Vicarage in Ambleside in the early afternoon, and were having a chat and a hot drink by the fire in the lounge as the snow continued to fall. There was time for a dip in the pool and a session in the hot tub before all of us (except John) met up again in the lounge for champagne and nibbles. We had a table booked at Sarah’s Kitchen, and were just about to tuck in when John arrived; it had taken about him two hours just to get from Burneside, and would probably have joined the stranded BMWs had he not had snow tyres fitted. We were the only customers tonight. We threw snowballs as we walked up to the Unicorn afterwards, along traffic free snow covered roads. It was very cosy as we enjoyed a drink or two in the pub, realising that we were probably stranded here in Ambleside. How wonderful! Ambleside was covered in 6 or 7 inches of snow when we got up on the Saturday morning. After a hearty breakfast we got ourselves sorted for our walk. It was too risky to venture out onto the high fells so John led the party of 11 plus Aggie, the dog through Rothay Park and followed the river of the same name towards Rydal, dodging the snow falling from the tree branches and Les’ sly snowballs. (He might be in his 70’s, but like our Stormin’ Norman, he has a tendency to be childish). We then did some ascent, which rewarded us with panoramic views of Rydal Water and snow covered Great Rigg and Fairfield in the distance. Our route then took us along Loughrigg Terrace, overlooking Grasmere before trudging through virgin snow on our way to Elterwater, where we saw a guy in shorts – there’s always one! From Elterwater we followed the riverside path to Skelwith Bridge, where most of the party went into the bar for a bowl of soup and a brew, though Neil and I had our packed lunch, sitting outside, basking in the sunshine. I kid you not. On our way again, we headed upwards to Loughrigg Tarn, Gillian was gradually shaking off her hangover, Debs was effectively sleepwalking. There was another ascent that took us beneath the upper slopes of Loughrigg before descending into Ambleside and for some us, into the pub. It had been fine throughout our walk, but it had started to rain as we sat down with our beer. Tonight we ate at the Glass House where I was impressed with the professional service and good food. 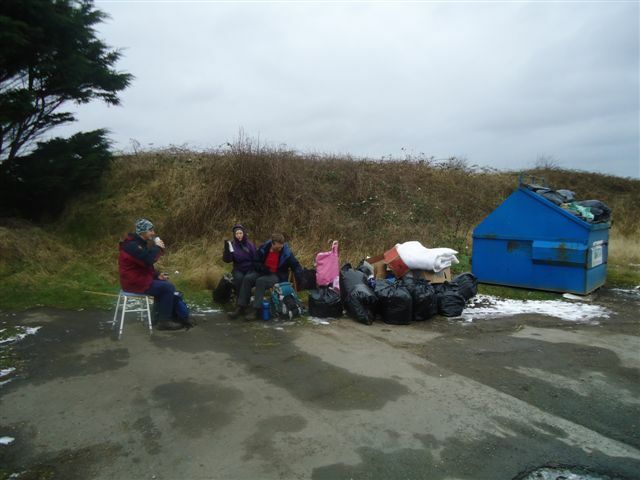 We were let down by the relative youngsters in our group, Gillian and Debs who had to excuse themselves before 9:30 to head off back and get some sleep! (They need to get out more). As is customary on the weekends, the hardy souls amongst us moved on to the Unicorn, where there was real ale and live entertainment from the Brian May look-alike singer. It was still raining as we walked back to the Old Vicarage…..
…but was fine as the ‘A’ party, led by John set off for Wansdale Pike and Bernard’s ‘B ‘ party went for a walk around Loughfigg Fell. There were 7 of us in John’s group, which didn’t include Roger, so we were in for a quiet day. Viv and Gillian decided to have a falling over competition on the way down towards Troutbeck, Gillian just edging it 4-3. We made for the Mortal Man, where there was a sign outside in large letters, “Free Beer”. On closer inspection, however, in much smaller lettering, “Wi-fi” was written after, “Free” and “Great” before “Beer”. One of the beers being served up was Sally Birkett’s Ale, which slipped down well with the hot vegetable soup. We left the pub and walked south along the road, then tracks and paths to Jenkin Crag and on our way we witnessed something that beggared belief…. a fell runner ran passed us in bare feet. No kiddin’. We continued through the woodland from Jenkins Crag and headed back to Ambleside. We intruded on the posh folk for our meal tonight. Viv had booked us in at the Salutation Hotel, where we had a tasty meal. A convivial evening, which rounded off another great winter weekend away. Many thanks once again to Viv for organising it all and to John for leading the walks. Leader: Norman Thomas. 18 walkers and 5 dogs. 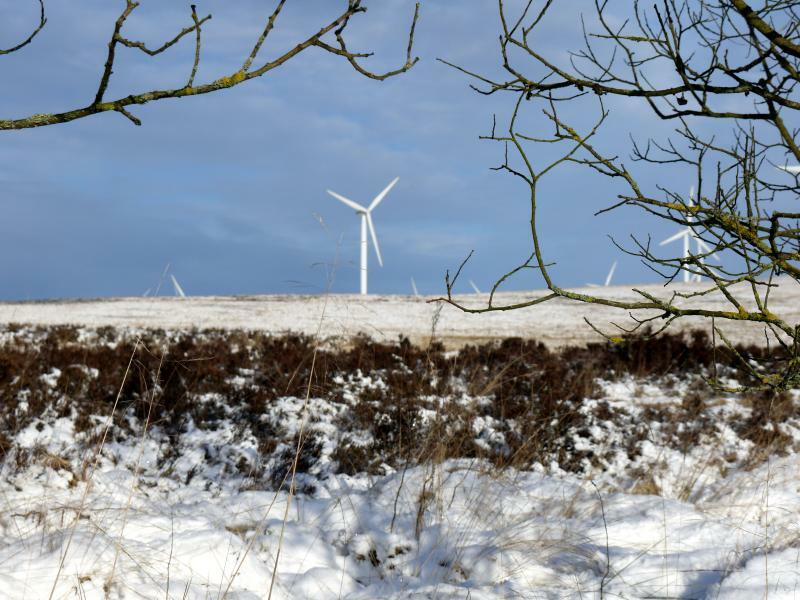 A word of explanation first – The Greenheart Way was recommended to Norman last year by a bloke he met as being a “cracking new footpath” between Leigh and Wigan. Norman asked me to investigate with the Wigan Countryside Service and, well to be honest, getting a definitive answer was like getting blood out of a stone. To cut a long story short the “Greenheart Way” is a swathe of land between Pennington Flash and Haigh Hall which has been reclaimed from former industrial sites etc such as collieries, and turned into leisure and park areas. It is not the set new footpath we had been led to believe. Norman and I decided that we could make up two circular routes of about 14 miles, one from each venue, which would come close to forming a figure eight in this tract of land. Part 2 goes ahead on Wednesday February 27th. At least all the snow had gone and although it was muddy it wasn’t quite as bad as Norman would have had us believe. There’s a man not known for his accuracy! We had five dogs on the day – Hilary and the ever energetic Maude, Jeanette and the ever inquisitive (especially where food is concerned) Poppy, Paul and Bailey and making their debuts (the dogs not the people) John and Mica and Kath and her neighbour’s dog Holly. So the intention was to create a figure eight of a walk. Norman took this literally and we must have done half a dozen figure eights before the lunch stop. “Haven’t we been down here before?” was heard several times. Anyone would suspect that maybe we had “strayed off the intended route” or even, God Forbid, gone wrong! But if we had our Illustrious Leader wasn’t owning up to it! We used the Leeds/Liverpool canal down to Worthington Lakes for a coffee break. Looped in and out of the Haigh Hall Plantations to Top Lock at Ince for our dinner, taken in driving wind and rain! Then several loops round again to Borsdane Wood for the afternoon break and back into Haigh Hall through the outskirts of Aspull. 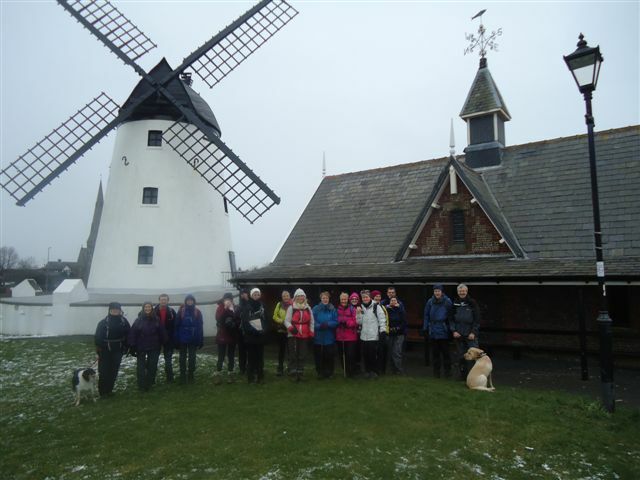 An excellent walk Norman, enjoyed by all and finished off perfectly in the Balcarres Arms!